Gareth Bale and Tom Huddlestone got the goals to see Tottenham into the fourth round of the Carling Cup and ease the pressure on under-fire boss Martin Jol. It was a deserved win for the hosts, who should have been well ahead before the hour with Jermain Defoe forcing keeper Brad Jones to save three times. But it was left to Bale to open the scoring after he rounded the keeper, before Huddlestone's header sealed it. Chris Riggott and Tom Craddock had Boro's best chances, but fired wide. Those efforts came either side of half-time, with Tottenham's defence nowhere on a couple of set-pieces, but the youngsters failed to hit the target when well placed. And aside from a Fabio Rochemback 20-yarder that Paul Robinson saved well, that was as close as the visitors came to a goal as Spurs dominated. Defoe was at the heart of all that was good about the hosts in the first hour, almost getting things rolling when he set Jermain Jenas through on goal only for the midfielder to fire wide. The diminutive striker then had a good chance blocked at his feet by the inspired Jones, before he set up Bale and Younes Kaboul for decent chances that were kept out by the Boro keeper. In the second half, Bale forced another save with a free-kick before Defoe twice came close - the second time with a fine diving header - that Jones again kept out well. But, with Spurs looking as if their profligacy would count against them, Bale popped up to race onto substitute Robbie Keane's pass to go round Jones and whip into the corner. Defoe's withdrawal for Keane had been roundly booed, but the home fans were rejoicing when Aaron Lennon then raced down the right to dink to Huddlestone, who headed between Jones's legs to seal matters on 75 minutes. 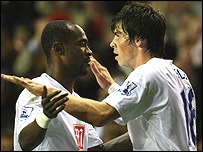 Tottenham: Robinson, Chimbonda, Kaboul, Dawson, Bale, Lennon, Jenas (Zokora 69), Huddlestone, Tainio, Berbatov, Defoe (Keane 69). Subs Not Used: Cerny, Bent, Rocha. Goals: Bale 72, Huddlestone 75. Middlesbrough: Jones, Young (Davies 80), Riggott, Wheater, Taylor, Cattermole, Boateng, Rochemback (Owens 76), Shawky (Craddock 46), Downing, Lee. Subs Not Used: Schwarzer, Hutchinson.